Although this seems to work, there remains a space between every fifth line. and I feel there should be a better / more elegant way to do this. You've hit the reverse situation to the one I ran into when I added web desgin to my arsenal a few years ago. CSS and InDesign layout aren't the same thing, and need different thought processes. Semantic considerations, as in HTML, don't really apply here, but I suspect that's how you got the idea to make line numbers their own paragraphs. 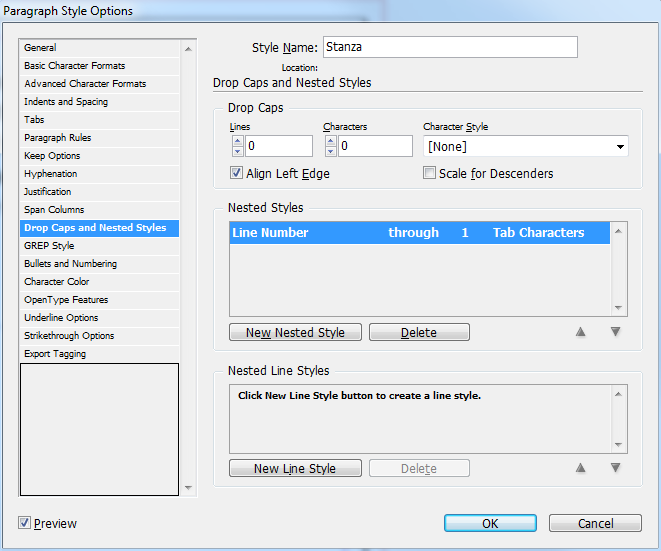 Your line numbers need to change from a Paragraph Style to Nested Styles (Character Styles), without any baseline shift, and you need to use first line indents as Lauren suggests. Replace the paragraph mark at the end of your first line number with a Tab. It'll look ugly, but ignore that for now. Clear overrides so it's all just your standard paragraph style (Alt/Option-click on the style name in the Paragraph Styles panel). Edit the paragraph style so it uses nested character styles for your line numbers, ending at the first tab. (I used only one style, but you may have one for the word and another for the number. In that case, the first style applies to 1 Word, and the second applies through the Tab.) Set the tab stop the same as your left indent. 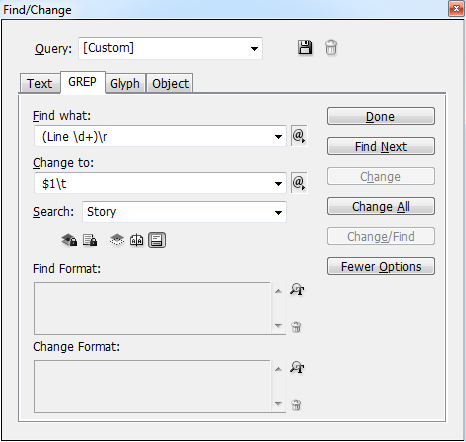 Select all the applicable text (Ctl/Cmd-A will select all text in an entirely story). In the Paragraph Styles panel, Alt/Option-click the modified paragraph style to apply it throughout and remove any leftover overrides. If you want to keep with your original approach you must remove the leading of the line numbers ("0" leading for line numbers) and also remove the space before from the text lines (0 space before in text lines). I tested the complete procedure and I can confirm that the final result output will look as you specified. Quick and Dirty Way: use tables. I don't know what your source text is like, but you'll have to dicker with it so that every line begins with either a line number and a tab or just a tab. Every line ends with a hard return. Column Separator: Tab; Row Separator: Paragraph. Lengthy But Automated Way: use indents. Dicker with source text so that you have Line Number, Tab, text to end of line, soft return, then continue with text with a soft return at each break until you come to the end of the fifth line. There you use a hard return. This means each five-line set is a single paragraph. Set your tab at (for sake of argument) 6p. Set your Left Indent at 6p. Now your text lines will wrap nicely. Whether you use Space Before is entirely up to you, but from your example, you shouldn't. Can I put a single word before my indent?